A few months ago, T. Dave Silva of House Dok Productions contacted me about writing a review of the Fractured Kingdom rpg. It had been mentioned in an RPG.net thread about rpgs that involve dreams and sounded really interesting. I finally was able to get around to reading it, and here's my review based on the read through. I haven't yet had a chance to play the game but I'm going to probably be rectifying that situation when I get a chance. Fractured Kingdom is a horror/conspiracy roleplaying game set in the year 2202. A lot of knowledge was lost during the Great War and through the actions of a religious movement called the Church of the Reclaimer that gained a lot of power during the war. The war created large wastelands and forced large populations into huge megalopolises. The geopolitical landscape has changed as well, allowing the rise of mega corporations. For the average person, the world is filled with technology that just works without any real understanding of how or why. Even the most meager of apartments is basically a smart home, with an entertainment system, Internet access and appliances know when your food will spoil or you're out of toilet paper. Through all of this a small number of people known as Lucids have become infused with supernatural power. They become Elucidated after some traumatic or important event causes them to travel to one of the four Outer Realms (the Dark, the Grave, the Slumber or the Verdant). Each Realm grants abilities that go along with that Realm's theme. There's a large dose of "secret world"-style conspiracy and mystery in the setting, as the player characters try to survive against other Lucids and the governments and corporations that want to use them for their own ends. Overall, the setting has a somewhat noir feeling, and harkens back to games like Kult or The Whispering Vault. I read the PDF version, which I assume is not much different from the print edition. The PDF is bookmarked but doesn't have hyperlinks. It is black and white with sidebars, and doesn't make use of annoying watermarks or obtrusive borders. For the most part the book is well-organized with a table of contents, glossary and reasonably complete index. The book is divided into five chapters with a few narrative pieces in between, as well as an introductory adventure. The book is well written, with only a few grammatical errors and odd turns of phrase. These errors become more evident in chapter five, which gives additional background information on running Fractured Kingdom. The art is reasonably well done, and reminds me somewhat of Ghislaine Barbe's art or perhaps some of the artwork from earlier White Wolf books. It definitely carries a kind of 90s feel to it for me and builds on the noir/horror feeling of the setting without detracting from the text. Characters in Fractured Kingdom are defined by groups of related characteristics. The base characteristics are ten Attribute "Trees", covering your standard attributes like Dexterity, Sense, Constitution, Mental, etc. From there, characters can also invest points in Skills, Abilities, and Boons. Skills and Abilities both have a parent Attribute Tree. Basically, Skills are focused applications of an Attribute, while Abilities are more ambiguous things that a character can do, ranging from Martial Arts styles to other things that might be considered "advantages" in other systems. Skills can also have Specialties and Abilities can have a Focus. Each Lucid additionally has a Realm that they have affinity with, which defines the kinds of supernatural abilities they can purchase. All characteristics that have a value range from 1 to 24 (or higher). Characteristics are bought with points, with a separate pool of Characteristic Points for each Tree that are used for purchasing Attributes, Skills and Abilities under that Tree. In addition, Lucids have a pool of Lucid points that can be used to purchase abilities or boons that are supernatural in nature or tied to the character's Realm. Finally, starting characters get Experience Points that can be traded in for Characteristic or Lucid Points, or can be spent to buy bonuses or other effects in game. The number of points given for each pool depends on the experience level that is chosen for the game (New Lucid, Expert or Veteran). Characters also start with a couple of background skills and a pair each of basic Lucid Abilities and Foci to round them out. Finally, characters can take Drawbacks which give them some extra Experience Points to spend. Boons are what make the game shine for Lucids. Each Boon is either Mundane, Supernatural, or tied to one of the four Outer Realms. They give each of the Realms a specific feel. Luckily there is a section on Boon Chains, which are lists of related Boons so a player can just pick one of the chains, buy up some required Boons, and go. There are a lot of moving parts in character creation (which the game freely admits), and the setup allows for a wide variety of character types from very narrow and focused to more broad and generalized. The example characters range from a sword god to a close combat character to a kindly-seeming elderly woman who can extend an aura of terror. When I sat down to create a sample character things started to fall into place pretty quickly, but I wound up setting up a spreadsheet to track point totals. It still took maybe an hour and a half with spending points and tweaking things out. I can see how it would be possible to nerf a character concept and wind up with characteristics that don't quite work as the player intended. Luckily, the characteristics don't have a lot of side-effecting mechanics (unlike, say, Charms in Exalted where every Charm is a rules-exception). Every characteristic is on the same scale and uses the same rules, perhaps with the exception of Boons - and even they aren't very complicated. The system is pretty simple and satisfies my, "Can I remember how it works without looking it up?" test. Basically, when attempting a task the player chooses or makes the case for the characteristics that would impact the roll. The ratings for all of those characteristics are added up. Then the player rolls a base d6, plus one more for each type of characteristic that applies (Attribute, Skill, Specialty, Ability, Focus). The result is summed and the rating total added, and that result is compared to a difficulty number. One interesting thing is there are no "botch" mechanics, and critical successes are either a function of Specialties or Foci, or bought with Experience Points. Besides buying the possibility of critical successes, characters can spend experience points on rolls to get bonuses, double the value of rolls, and recuperate or recover energy. So what is going to stop a character from trying to open a can of peas using five Characteristics? Well, if he's in the comfort of his own home, nothing. If he's doing it while fighting off nightmare monsters, he has to spend Energy. An average Expert Lucid seems to have about 100 to 110 points in their Energy Pool. Every time you do something in a stressful situation, you have to spend 1 point per characteristic used on the roll.. This doesn't work like the dice - if you are using two Skills for a roll, you are paying 2 Energy even if you only get one extra die on the roll. Boons have Energy costs as well. I have my doubts about the result ranges involved in the dice rolls. It seems like under a lot of circumstances the base number from summing the characteristics is going to be high - at least over the median result for the die roll (the example in the book has a character rolling 6d6+54). When I see this kind of setup I always think, "If the values were reduced and the die roll scaled down, wouldn't it have the same result spread?". In a way it's the opposite of what we've been conditioned to look for in die rolls, where we expect the bonus to be some fraction of what the highest possible roll. I'd honestly have to play a few sessions to suss out how smoothly it works. Combat is resolved by rolling attack versus defense. Weapons have a Weapon Rating which is added to the roll, while Armor has an Armor Rating that is added to the defense. The amount of damage done is equal to 2 points for each Characteristic used in the attack, plus the weapon's Strength rating. Armor has a Strength rating that reduces the damage done. Depending on the type of damage done (Health or Ego) it is subtracted from the appropriate Life Pool. Attacks that do a significant amount of damage result in Wounds, which are represented by placing a checkmark next to an attribute (again, depending on the type of damage). The part I like is that whenever the character uses a characteristic from a Tree that is wounded, they suffer additional Ego damage. Suffering too many Wounds results in more serious injuries (called Limitations). Eventually, the character will start dying. The system avoids a "death spiral" while at the same time penalizing the character in an abstract way. There are a number of attack and defense maneuvers that can affect rolls and actions, and they seem to cover most of the basics - aiming, all out attacks or defenses, etc. The setting chapter covers the basics of the world of 2202, including the history of The Great War, the current geopolitical landscape, and the cities that have the highest concentration of Lucids. It also goes into the Baronies, groups of Lucids that can be antagonists or protagonists, as well as supernatural creatures and a more mundane bestiary. The setting itself does not have a lot of detail. To me this is a good thing, because in the end Fractured Kingdom could work with nearly any modern setting with very little fuss. One thing that the section lacks is any hard details on the Bridges which allow crossing from the mundane world to the Realms. It's known that they cause problems with the local environment, but otherwise aren't detailed in terms of the system. Do they provide bonuses when using Realm abilities near them? Are they merely gateways to the Realms and nothing else? Obviously the GM can fill in those blanks, but it would have been nice if they got a more detailed treatment. The introductory scenario, Song of Silence, includes write-ups for the characters who are introduced throughout the rulebook. They are a good mix of different Lucid abilities and are good for getting a feel for what Lucid characters should look like. Without giving away any spoilers, the scenario is a good introduction to the elements of the setting and has a mix of combat and noncombat options. Support for "Mundane" characters is present, but they have limitations when compared to Lucids who simply tend to be tougher, more capable and have all kinds of nifty powers. Playing a Mundane among a group of Lucids would get boring pretty fast. A gear chapter rounds out the book, covering basic equipment, weapons, and armor. The game uses Purchase Values in lieu of currency, representing how difficult an item is to obtain. The Fortune Attribute governs how much purchasing power a character has, and there are other characteristics such as Wealth that can add to rolls when trying to obtain an item. In all Fractured Kingdom has an interesting premise and is a good addition to the horror/conspiracy genre. For me it is right up there in terms of feel as Kult and The Whispering Vault, but with its own twists and a cosmology that isn't obviously derivative. It's a good buy for gamers interested in the genre, but does lack a little bit on the supporting details which could be a problem for newer GMs. On the player end, character creation can seem a little daunting but not overwhelmingly so. Even without a play through it appears that the system is utilitarian but has some nice features to help support the style of the game, and it's entirely possible that some of the elements that seem a little clumsy (such as adding up characteristics, then rolling and adding that) would be just fine in play. Fractured Kingdom can be purchased on DriveThruRPG or Studio2Publishing if you prefer a print copy. 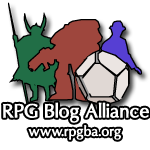 Could This Ruling Affect RPGs?